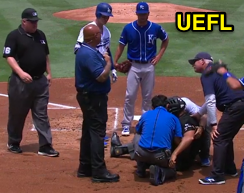 Kerwin Danley left Sunday's Royals-Dodgers game in the 2nd inning after a foul ball head injury at Dodger Stadium. It is Danley's second significant game-ending head injury suffered as plate umpire in Los Angeles, including a 2008 episode that required an ambulance and ended with a concussion diagnosis. Kerwin Danley is assisted at Dodger Stadium. With two out and none in the bottom of the 1st inning, Dodgers batter Cody Bellinger fouled off a 94.3-mph fastball from Royals pitcher Danny Duffy into the central forehead portion of Danley's hockey-style mask (HSM), causing him to lose his balance and be helped to the ground behind home plate by Royals catcher Drew Butera, Belinger, and several Dodgers staffers. After remaining in the game through completion of the inning, as well as the top of the 2nd while crew mate and 1B Umpire Adam Hamari put on the plate umpire's equipment, Danley was replaced behind home plate by Hamari, while base umpires Todd Tichenor (2B => 1B) and Crew Chief Bill Miller (3B) officiated the field for the remainder of the contest. Relevant Injury History: Danley has a significant history of traumatic head injuries as plate umpire. > On April 7, 2016, Danley remained in a game after a 98-mph fastball to the head. > On May 12, 2015, Danley exited a game in Arizona as the result of a 94-mph pitch fouled into his HSM. > On June 3, 2013, Danley exited in Cincinnati after a bouncing ball deflected and struck his mask. > On April 21, 2009, Danley was carted off the field after a broken bat struck the side of his head. > On April 26, 2008, Danley was knocked unconscious in LA by a 96-mph pitch directly to the mask.